A bag with a bonus! Here’s a bag with a bonus! 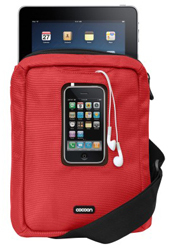 The Cocoon Innovations Messenger Sling bag not only protects and transports the iPad, but it also contains an extremely functional insert, the GRID-ITTM. The GRID-ITTM is designed to hold pens, a stylus, earphones, flash drives, notepads, business cards, charging cord, small electronics and other accessories. Customize it any way you like with the woven elastic grids that hold the accessories in place. The back of the GRID-ITTM even doubles as a mouse pad. Inside the bag, the iPad is protected between the padded interior pouch and the back of the GRID-IT™. Outside, there’s a pocket in which to carry an iPhone. A clear window provides easy access to the iPhone’s interface without having to remove it from the bag. The Messenger bag is available in red, gray, and black. Retails for $29.99.